Today's supply chain in becoming ever more complex with all sorts of different relationships along the way. It would be fair to say that nobody is just a manufacturer or a retailer or a distributor anymore. The lines are very blurry and everyone is selling through more channels than ever before. Undoubtedly, technology has helped to improve our daily lives and it is a "no-brainer" for us to embrace evolving technologies as they happen. We all jump on board without a moments hesitation, because we know that it will help to improve our daily lives in one way or another. When it comes to the supply chain, it is true that a move towards modern technology may require a little more thought and planning than simply clicking on a new App to download. But the benefits of embracing cloud technologies are enormous for everybody involved in the supply chain from manufacturers to distributors, shipping companies and ultimately the end consumer. How to improve the supply chain with cloud erp? Well, it's ultimately about keeping the machine well oiled, using technology such as IoT to do things faster, more efficiently and smarter and ultimately serve your customers better. Practically speaking, it could mean gathering important data and analytics from sensors placed on equipment that will enable you to predict when a service is due, rather than facing down-time in your production process when a machines decides to have a bad day. The possibilities are endless. 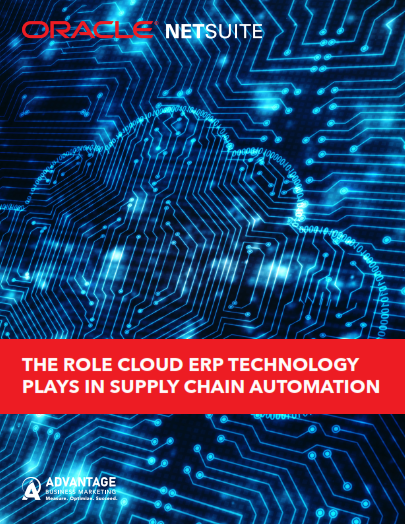 Here's a report from Oracle NetSuite that looks at the benefits of supply chain automation with cloud erp.